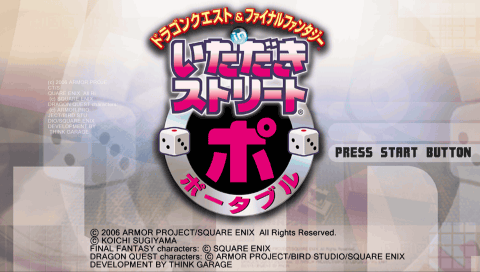 Dragon Quest & Final Fantasy in Itadaki Street Portable is a board game for the PlayStation Portable. Itadaki Street is a video game concept by Yuji Horii that can be best described as Monopoly with a stock system. It was initially released for the Famicom, and has spawned many sequel games. 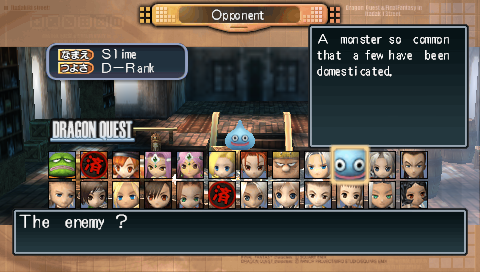 It took a while before his more popular franchise, Dragon Quest, was integrated into the game in the spin-off title Itadaki Street Special for the Playstation 2. The game was a hit, so a version of the game for the PSP was bound to happen. Out came Itadaki Street Portable. The game is not necessarily a port, as both the character and stage rosters are vastly different. In addition, this game (unfortunately) lacks the Sphere Mode present in the Playstation 2 title. This patch is an English Playability Patch with the goal of making the game completely navigable for an English speaking audience, and it does that job very well. 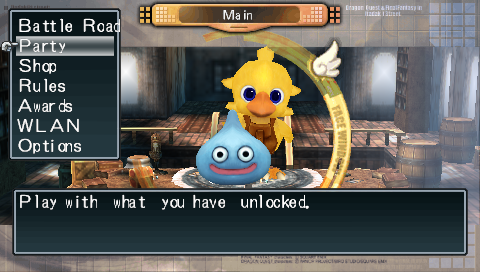 Just about everything is in English, except a few cosmetic spots - like in-game dialog between the characters, which display as a bunch of gibberish for the time being. This is the third version of the patch to be released since the project started in April of 2011, and updates are infrequent as the project’s main goal has already been attained. ‘Translations’ are performed through Google Translate, Babylon, the WWWJDIC, and a little common sense. The author is not a fan of the Final Fantasy series, so accuracy is not guaranteed. Menus are complete, almost everything is navigable. The exception being the save menu, unfortunately, which is handled strangely. Character Names and Descriptions, in addition to some select dialog (Alena, Meena, and Maribel). Most Chat Circle conversations are complete. Board Names, Board Descriptions, Area Names, Space Names and Descriptions. 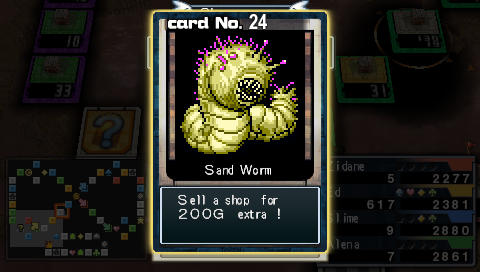 Chance Cards and their descriptions. All Casino games and their instructions. Morrie’s monologues. Not all of his text, but everything he says after completing a part of the Battle Road. 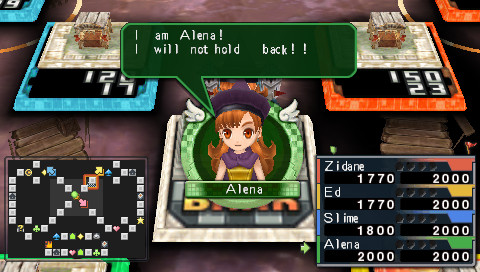 All NPC (Torneko, Eiko, and Imp) dialog is complete.